Bass preamp and DI box. 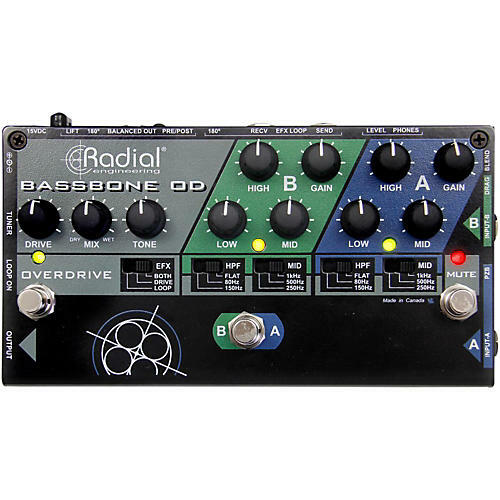 The Radial Bassbone is a power-packed bass preamp that combines on-stage efficiency, amazing tonal control and superb audio performance making it the ideal front end for both live and studio recording. Designed as a bass command center, the Bassbone lets you connect two basses and seamlessly toggle between them using a footswitch. Each channel is equipped with a separate level control to balance the two instruments. This is augmented with a unique EQ that enables you to adjust the tone for each instrument to match with your bass amp. In fact, the EQ is so powerful that you can toggle between channels to emulate switching from a P-Bass to a Rickey using the same bass! For added stage control, a second footswitch engages a power booster for soloing. This works double duty to turn on an effects loop. The Bassbone's highly acclaimed audio circuit features full sized discrete electronics for optimal signal flow to deliver the sound of your bass to your amp with minimal distortion or artifact. Outputs include a ¼" instrument output for the stage amp, separate always-on tuner out, and a built-in Radial direct box to feed the PA or recording system. Control and great tone in one pedal. Order today!